Bake perfect pies every time in this Baker's Mark 8 15/16" x 1 1/4" foil pie pan. This 38 gauge aluminum foil pie pan is sturdy enough to withstand travel and works well for baking and storing delicious pies from apple crumb to blueberry or pumpkin! Thanks to the extra deep depth, this pie pan is an extremely versatile option for virtually any facility. These are our go-to pie pan in our bakery. We make on average 40 pies a week. They are durable and washable. We use them more than one time. not sure why they are called extra deep but for a pie they are a perfect size. I can get the correct amount of filling and they don't look cheaply made unlike the shallow size. The Baker's Mark extra deep foil pie pan are terrific quality and very sturdy in their design. They are great for making our apple pies. This Bakers Mark 9" x ! 3/16" extra deep pie pans are a good standard size pie. Hold a good amount of filling and is sturdy enough to handle the extra filling. These pie pans were the perfect size for our fundraiser and fairly sturdy. It was very nice to have a little extra depth. Our customers were very happy with them! A decent pie pan. Not super heavy, so you may need to place pie pans on another baking tray, but you cannot beat this price. These pans are great disposable pans. They are low-cost and fairly sturdy. My students used these for pumpkin, apple, and pecan pie. All turned out perfectly. Can you guess what I use these for? Pie! Any kind of pie, these are perfect for the farmer's market. I slide them into the 9x9" bakery box item #245993WBK and they present beautifully. I use these foil pie pans for all of my pies. They are the perfect size and I love how durable they are. I would becoming these to anyone and day. Great pans and great price!. Perfect depth for my pies. ( and I like deeper pies) Sturdy and the right size! I would definitely re order these again! We use these foil pans for our quiche. They are sturdy and reliable, plus the price is great. We have used both a flour crust and a puff pastry crust, and both serve well out of the foil. Great pie pans at a great price. They arrived in great condition very quickly. They have a good depth- not as deep as a ceramic deep dish but not as shallow as a store-bought pie pan. Good for retailing pies and still using a double crust recipe. baker's mark 9 inch its the size we use every year for make our pies for thanksgiving and for me they are perfect not to high but you can put a nice amount of filing . These are the best pie pans for Thanksgiving dinner. They fit perfectly in the 10"x10" boxes sold on this site. They hold the perfect amount of filling. I have bought these pie pans for the last 2 years or longer. They are very sturdy, and hold our pies very well. Will definitely buy more as needed. Baker's Mark makes pretty good products. This one is no exception. 9 inches makes a good size pie and they fit perfect into the pie containers. These pie pans are perfect for all of our pies and the price is excellent. We use them for everything from apple to pumpkin to chocolate silk and they fit perfectly & snugly in the 9" window boxes. Best foil pie pan! Extra deep that gives you more room for more filling. Sturdy and durable and most of all affordable. Highly recommend and should try it! These pans work great for our standard pies. Only a 4 star rating from me because I wish the foil was a bit heavier to provide a more solid pan for our fruit pies that run on the heavy side. We use these pie tins for our homemade pies. They are very sturdy and bake well. They hold up well in the freezer and out on display in our case. Perfect pie pan, not to shallow not to deep, a little flimsy so definitely bake on a pan for easy removal from oven.. love them. This is a nice sturdy pie pan. It's great for deep pumpkin, pecan and apple pies that I make. I found it fits perfectly in the 9"x9"x2.5" cake box, too! It is a great pan for baking and displaying our pies. It makes easier cleaning up since it is disposable. It is sturdy enough to transport the pies safely. This are great pie pans for everyday baking! I bought these for our church because we us pie pans to make peanut brittle around the holidays. As you can imagine we re-use them and they held up for a little bit but I think I got the wrong kind for our application. Given the abuse they got-a great product! Thanks! These foil pie pans are perfect for pie or crumb crusts. They maintain their shape while you are working with them and support the weight of your ingredients. Perfect for making pies. Good quality. Not the highest quality but will not rip or tear. Will easily pout of with normal cutting. Last ones I bought from another vendor tore holes in them just pulling them out of box. I will continue buying these in the future. These are a great price. They hold up to even my heaviest pies. They make it easy to make lots of pies at once. I will definitely order these again. These are my go to pans. I bake pies and cinnamon rolls in these pans. Perfect for freezing to. Also great for leftovers or sending home meals with guests. This is a great option for a disposable pie pan. And they fit perfectly into the plastic display cases and make for a great transport. We love these pie pans, perfect size for pies and when we cut in them at the bakery, we wash em up and re-use for to go orders. really nice deal on the baker's mark extra deep foil pie pans. nice large case of 500 that will last us a while. couldn't go wrong on the price. I ordered these 9" pie pans for my cream pies and I love them. They are the perfect size. You can truly find just about everything for your business on this site. These deep foil pie pans are great. I bought them to fulfill all my Thanksgiving pie orders. They hold up really well, even with heavy weighted pies. These worked great! We had zero problems with them as we baked pies in them than gave them to our customers. We wish they came with lids, not ones that went in the over but ones to put on when we give them to our customers. Very nice quality foil pans, hold lots of filling. They fit the 9" pastry boxes very well.125 pack is definitely economical. Also want to say Webstaurant customer service is excellent! Save yourself the time and by the disposable pans they are easier to use than the aluminum ones and will save you on labor throw them away when you're done. These are marked as "extra deep" but we don't feel this is very accurate as the depth difference is not noticeable when we add our pie filling. These pans are perfect for my 9 inch pies and chicken pies. I use frozen pies crust that are found in the refrigerator section at the grocery store. These are excellent for use with these pie crust you unroll and cheaper than trying to buy frozen shells. Can't wait to get our Pie Pans! We plan to use them for plates at our wedding! We Love Websturantstore! We will continue to do business with them! These are the best option for holiday pies. The tins are deep enough to hold a great amount of filling and have a well defined rim to help hold the crust up for crimping. Can't beat the price! 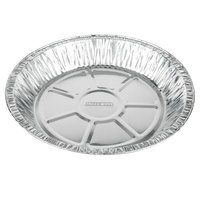 Basic aluminum pie dish, great for multiple uses. The price in unbeatable and will order again and stock up for pie season this fall. was very pleased with this pie pan. I used this pie pan with the deep dish container #99903240. They worked well together and the pie looked great. Great value for the price. We purchased them last fall for the first time for our holiday pies. They worked great for a standard pie size. We were looking for a pie pan for our take out orders and I saw these. Now we've been using months and we love it. These pie pans are just what I needed for the busy holiday season. A fraction of the cost of anything you will find in the store. The is a great pie pan. Exactly as described, very deep for extra yummy fillings. The price is great, especially liked that I could buy a small amount. We love these pie pans - such a great size and deepness and not flimsy at all. We always buy from Webstaurant and love the products! I love these pie tins! They are a great value. I use them for cinnamon rolls that I make in bulk and then freeze for later. They work really great. I also use them for baking pies that I am giving away so I don't have to worry about getting a pie dish back. 9" extra deep pie pan is the perfect size for our special pie. Here has good price, we will need to continue order, since we like the size and price. Extremely flimsy pan. Not any deeper than a regular pan. Can't even form a crust around it without it folding all over the place. Do not buy these!!! Thank you for your review, Beth! We are sorry you did not like these foil pans. They are an excellent solution for disposable pie plates offered at a great value. A Customer Solutions Representative will contact you shortly. Nice deep pan! My ice cream shop is starting to have baked goods-this deep pan is perfect for the pies that we are going to start serving soon! Sturdy and simple! Great price too! We use these pie pans to make all of our pies. They are sturdy so you don't have to worry about a pie being too heavy. Hold up well when cutting and make for super easy cleanup. Great value. Very Happy with the Product and the timely manner in which it came. Thank you very much!! There was a concern about the shipping time of the item and your team worked very hard to make sure I would receive on time and I greatly appreciate it. Would definitely order from you again! !